Áiseanna Tacaíochta (ÁT) welcomes the news that the Health Service Executive (HSE) is seeking €250 million to move people with disabilities from residential centres to community-based models of care. Over 8,000 people with disabilities live in residential centres – or congregated settings – in Ireland. A congregated setting is defined as ten or more people with disabilities sharing a single living unit or residing in campus-based living arrangements. It has been revealed that the HSE has sent a costed submission to the Department of Health, outlining the challenges faced in meeting the standards of the Health Information and Quality Authority (HIQA), which has uncovered significant failures in quality standards in the sector in recent times. The plan also draws out the work done to date on transitioning people with disabilities from congregated settings to community-based care models. In this light, the HSE proposes to initiate a plan comprising of four strands, starting with a priority 11 projects where 237 people with disabilities live in large institutional settings which have the most significant compliance issues with HIQA. This will incur costs of €22.4 million. The first three strands – two of which are hoped to start this year – affect 992 residents, with the fourth impacting on a total of 1,863 residents currently living in 55 settings. These are estimated to respectively come to €89.4 million and €163 million in capital and once-off costs. 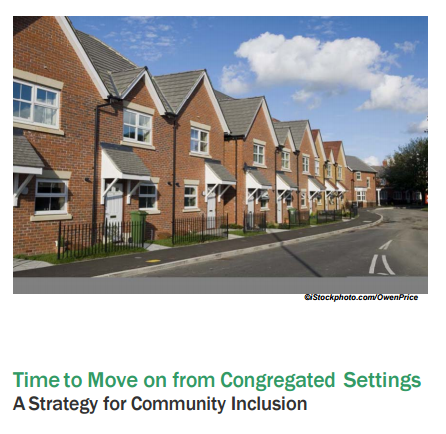 The plan aims to strengthen the implementation of the Time to Move on from Congregated Settings report of 2011, which recommends that people with disabilities living in congregated settings are offered alternative housing in mainstream communities and that remaining institutions and residential centres, serving ten or more people, are closed. The report advises that this be completed by 2019.